I shared before, that my Husband and I celebrate our wedding anniversary in February. Today I want to share the pictures and the recipes with all of you to thank you for all the wishes. Should I say anything more? Chocolate shavings were a decoration but because it’s still February, the month of chocolate, I had to play with it a little. 🙂 It came out really well, don’t you think? 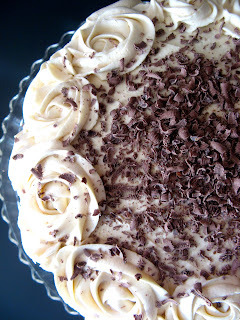 The recipe calls for using two 8″ square or 9″ round cake pans, but I used 3 8″ round cake pans. It worked great, as I didn’t have to cut each layer in half. Grease and flour your pans and set aside. In a medium mixing bowl, whisk together the dry ingredients ( flour, cocoa powder, soda and baking powder and salt ). Set that aside. In a large mixing bowl, mix the butter for 30 seconds. Add sugar, 1/4 cup at a time. Beat the butter and sugar mixture for 4 minutes. Add vanilla, mix again. Starting with the dry ingredients, alternating with milk and ending with dry ingredients, add it all to the butter and sugar mixture. Divide into prepared pans. Bake 30 – 40 minutes, rotating pans half way through baking time. Bake until the toothpick inserted into the center of each layer comes out clean. Cool the cake in pans for 5 – 7 minutes, then invert onto cooling racks to cool completely. Place the sugar in a medium saucepan. Place on medium heat and whisk. Eventually, it will start to melt and clump up. Just keep whisking. It will melt and turn caramel color. When all the sugar is melted, remove from heat and add all the butter. Keep whisking until smooth. Add the cream, pouring slowly. Whisk until all combined and smooth. Pour into a jar and let sit for 10 – 15 minutes on a counter. Place in the refrigerator while you make the brownies and frosting. It should keep well for 2 weeks in the fridge. It will turn cloudy while it cools. In a large mixing bowl, beat the shortening and butter for 2 minutes. Add the flavor extract and beat it in. Start adding the sugar, 1/2 cup at a time, until you reach desired consistency. Add milk, starting with 1/2 Tbsp, until you reach desired consistency. Use right away or store in refrigerator, covered. You may have to mix it for few minutes before using. Add the whole amount of prepared ( and cooled completely ) caramel sauce to the prepared frosting and whip for 2 – 3 minutes. He is the most amazing, caring, loving person I have ever met. He is my Best Friend, the Love of my life. He is always there for me, he knows me like nobody else. I can’t imagine my life without Him! He works hard so I can be home with our kids and I will always be grateful for that. From the beginning, he supported my blogging. Even when the frosting is falling off the cake or the yeast dough is not rising, and I just want to throw it all out and shove my decorating tip to the lowest drawer and forget it all, he knows how to bring my confidence back and see things in the positive light. Sweetheart, thank you so much for being mine! I am the luckiest woman in the whole World because I have you. I am truly honored to be your wife. Happy Anniversary! The cake is lovely! 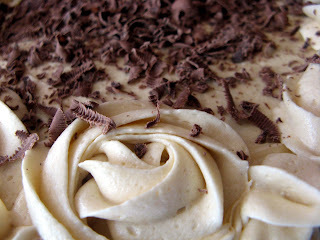 Caramel buttercream frosting!?! I can definitely celebrate with this. Happy anniversary! What a wonderful ode to your husband!! He sounds like an amazing man, and you are an amazing woman, so what a great pair you are!! This cake is drop dead gorgeous (as always), and a wonderful way to celebrate! Hope your week is off to a great start Anna!! Awww, thank you so much, sweet Maggie! Hugs!! Happy Anniversary!! WHAT a FANTASTIC cake – so beautiful and I'm sure it must have melted in your mouth!!! oh! how i wish my wife make this for me, too bad she's dont know how to bake cakes like this haha! she only know is how to eat it when its ready. Congrats btw, and thumbs up for the super yummy cake you have. see ya. Thank you so much, Soni! Thank you so much, Laura! It is my favorite way to decorate cakes and cupcakes right now and something tells me it will be for a while 🙂 Hugs! Your husband is a lucky man! The cake looks out of this world pretty and what is even more beautiful is, it is baked with LOVE! Happy belated Anniversary to you! Awww, thank you so much 🙂 Welcome to CCS! An elegant cream cake! Love those piped roses…very pretty. Anna that is such a lovely note to your husband. It's wonderful when you truely find your match made in heaven. How many years are you married. We will be celebrating our 28th anniversary in May but were best of friends for 11 years prior. 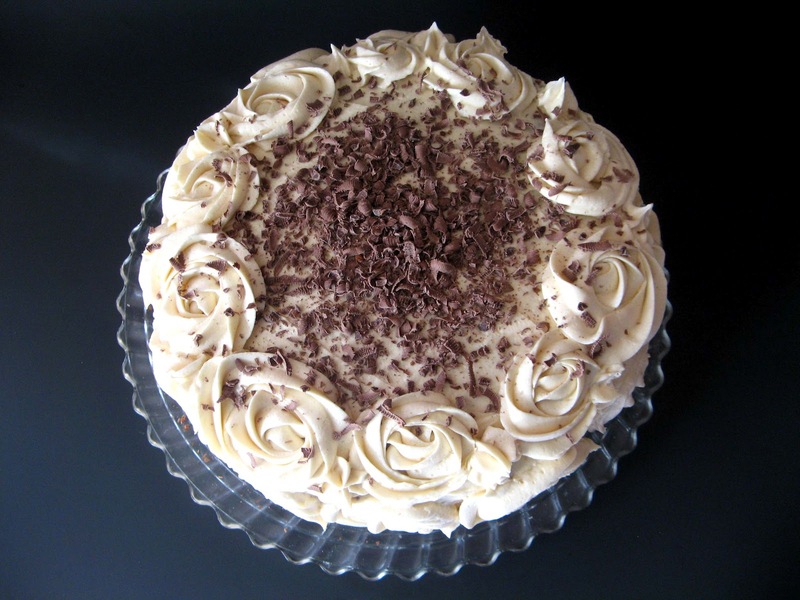 Your cake sounds wonderful and since I love to make tall layered cakes I will try this – maybe for our anniversary. It looks beautiful. We celebrate every occasion with cake and a special din ER either at home or a favorite restaurant. Thanks for sharing your special day with us. Wishing you many, many more years of wedded bliss. It's our 6th Anniversary. We had an amazing time! Thank you so much for the wishes and the comment, Vicki! I am looking forward to seeing your Anniversary cake 🙂 Have a great week! Happy Belated Anniversary! What a sweet post. I hope you have many, many, many more years together. Your cake sounds wonderful. The idea of putting a whole batch of homemade caramel sauce into a buttercream frosting has me drooling. It must have been as good tasting as it is impressive to look at! Thank you so much, Kristen! The frosting is amazing indeed 🙂 Have a wonderful week, my friend! What a stunning cake!!! And such a beautiful tribute to your dear husband <3 Have a wonderful weekend! I saw this in my reader and oh my goodness that cake is so beautiful. I would have had hard time cutting it, but then what good is a cake if you don't eat. Here is a pat on the back for a job wonderfully done. Happy anniversary to you and your husband. Thank you so much, dearest Kristina! The consistency of your frosting has a lot to do with the shape of the roses. I can make a tutorial if you are interested…Have a great week! What a beautiful cake to celebrate your annivesary with. I hope he enjoyed it. It's almost too pretty to even eat. Happy Anniversary! Thank you so much, Vicki! Congratulations on your anniversary–that is one stunning cake! And caramel frosting…sigh. Looks delicious. You have an award waitng for you at my blog. Please pick it up. Happy Anniversary Anna! The cake is a showstopper! Stunning! Thank you so much, Roxana! Beautiful cake! Perfectly decorated! Happy Anniversary! The cake is gorgeous. Happy Anniversary to you both. It is such a blessing to find that perfect combo – the one who truly both completes and compliments who you are. This is such a beautiful cake! Happy anniversary! It looks delicious! Happy Anniversary! 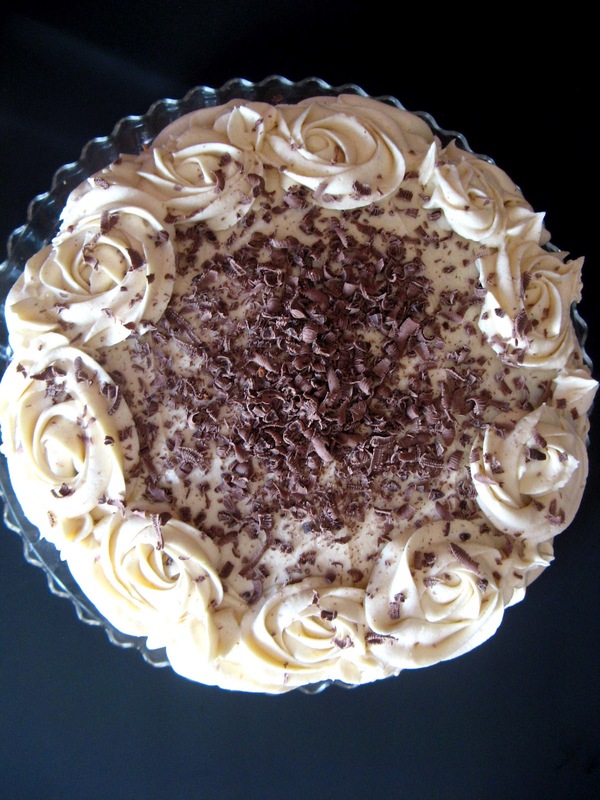 The cake looks stunning with a nice caramel butter cream frosting. 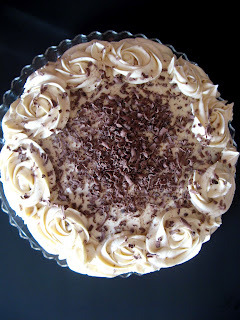 i love the way you did the rose icing and the chocolate shavings in the center. Happy Anniversary! Thank you so much, dearest Balvinder! Hugs! Wow, Anna, it's beautiful! Masterpiece! Thank you so much, Marina! Hugs! Happy Anniversary! Such a beautiful cake for a wonderful occasion! There is nothing like sharing a delicious dessert with the one you love. Beautiful recipe – lovely story. Thank you for sharing. Thank you so much for reading and such a lovely comment! Happy Anniversary to you and your hubby! 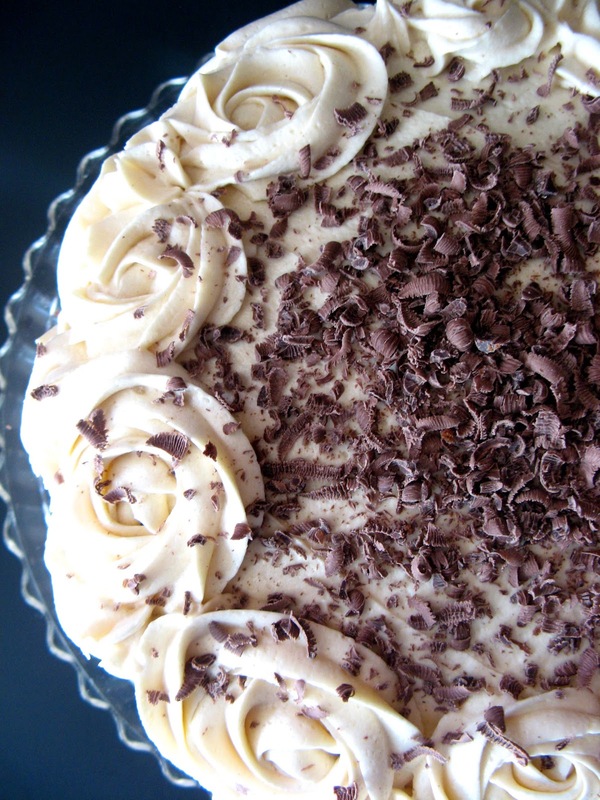 This cake is perfect for the occasion, beautiful and sounds delicious! Thank you so much, dear Amy! Nothing like an awesome cake to celebrate time spent with your soul mate! This does look like it has some tasty flavor notes to it, but I am partial to chocolate anyway. If it tastes even half as good as it looks in that picture-you have a winner-yum! Aww, thank you so much, Tina! This is so beautiful and romantic! Your husband must be touched seeing this. Happy anniversary! He was 🙂 Thank you so much, Zoe! Hugs! Thank you so much, Suchi! Happy Anniversary! The cake looks wonderful, but out of my calorie range…!! Well ok maybe just a taste please…. lol 🙂 Thank you so much, Richard! Sound Amazing! Saturday is our anniversary, I should really make a cake like this one 🙂 Happy Anniversary! oh man…at first I was getting emotional at the thought of making/eating this cake…but your comparison of you and your hubby to a can't-live-without-each-other-chocolatey pair…I teared up a little! Cant wait to try this frosting out. And here's to wonderful Hubby's! Cheers! 🙂 Thank you so much! I do hope you will make this frosting some day – it is out of this World!! Awww, you are so sweet, Ramona 🙂 Thank you so much for this wonderful comment! Hugs! Blessings to you both on your anniversary. The cake is making me so hungry! All my favorite things in one recipe! Thank you so much! I am so happy that you like the flavors combo! Thank you, dearest Serena! It truly means a lot. Hugs! !